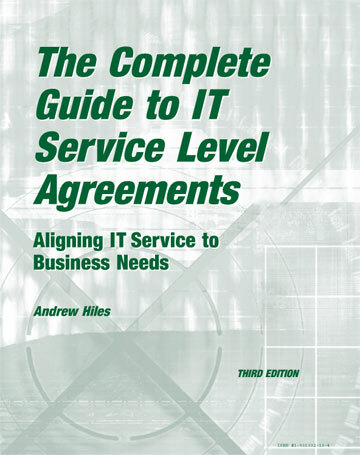 Covering all aspects of Information Technology Service Level Agreements (SLAs), this essential manual is your step-by-step guide to designing, negotiating and implementing Service Level Agreements into your organization. It reviews the disadvantages and advantages, gives clear guidance on what types are appropriate, how to set up SLAs and to control them. An invaluable aid to IT managers, data center managers, computer services, systems and operations managers. Most suppliers lose around 16% of their customers each year. The reason? Poor service – whether perceived or real. Any technology-based support service, whether in-house, contracted or outsourced, stands to be accused of being insensitive to the requirements of its customers (or users). Equally, customers of a support service may have unrealistic expectations of what can be reasonably provided. Service Level Agreements (SLAs) can overcome these gulfs. A Service Level Agreement can create harmony between parties and can prevent disputes between customers and suppliers. It can justify investment and identify the “right” quality of service. It can mean the difference between business success and failure. SLAs are potentially a strategic tool to align all support services (particularly IT) directly to business mission achievement. In the past, few organizations used them in this way. Armed with this book, more and more businesses are now succeeding. Where are Service Level Agreements going? Increasingly business-focused. Increasingly measured in real-time. Simple documents that cover complex service infrastructures. Providing a competitive edge. Embracing penalties. The brave, who commit to tight SLAs and perform against them will win the commercial spoils. This book provides the knowledge and tools based on fifteen years of intensive development to ensure your enterprise is among the winners. A Rothstein Publishing Classic Title. 2002, 278 pages. Most suppliers lose around 16% of their customers each year. The reason? Poor service. Typically if you provide good service, your customer may tell five people. “Customer promiscuity” is the norm: your customers and prospects are one click away from your competitors. Discontented customers typically tell over ten people how bad you are. In the days of bulletin boards, a discontented customer can place messages that can impact – maybe even destroy – your business. In the often dangerous and unpredictable e-world, Service Level Agreements are imperative to protect both parties. Any support service, whether in-house, contracted or outsourced, stands to be accused of being insensitive to the requirements of its customers (or users). Equally, customers of a support service may have unrealistic expectations of what can be reasonably provided by it. Service Level Agreements can overcome these gulfs. All too often service level reports are misleading: bad statistics, measured in ways and at points that do not truly reflect the service experience of the customer. This book exposes pitfalls, problems and challenges in e-business Service Level Agreements and lays the foundation for harmonious and effective customer-supplier relationships to enable actual service delivery to become aligned to customer expectations. What, then, is a Service Level Agreement? A Service Level Agreement is simply an agreement between the support service and the user quantifying the minimum acceptable service to the user. SLAs are particularly valuable in real time activities of e-commerce where speed-to-market is crucial; where there is no time for mistakes; and where millions of dollars can be lost in minutes. A Service Level Agreement can create harmony between the parties, and avoid disputes between customer and supplier. It can justify investment and identify the “right” quality of service. It can mean the difference between business success and failure. Some 15 years ago, the UK IBM Guide Operations Managers group (of which I was Chair) held a meeting in which we discussed the concept of SLAs. I had read about the pioneering work in this area by Bill Miller of American Airlines and developed by the Capacity Management Group. Seizing on the concept as good management practice, I first implemented them in the company for which I was then working. It really was leading edge stuff in those days and there was little guidance, so in 1988 I began to present training workshops on the topic. These aroused considerable interest and I was persuaded to write the first book on the subject, published by Elsevier. Believing this concept was equally applicable to any support or supply service, the second book, suggesting this transition, quickly followed. We began to receive inquiries about SLAs from a wide range of public and private sector enterprises, covering a broad spread of business and support functions. Since then we have presented on SLAs at conferences and workshops around the world and written literally hundreds of articles on the subject. My vision in SLAs is simple: SLAs are potentially a strategic tool to align all support services (especially IT) directly to business mission achievement. Sadly, few organizations use them in this way. The early SLAs were IT-centric, written in IT technical terms, and predominantly provided the IT user with service levels that had more to do with internal IT performance measurements than with business-oriented service achievement. Frequently metrics were inappropriate, measurements imprecise and monitoring weak. The SLA reports simply did not reflect the experience of the customer when using the service. Now, the more mature organization writes business-centric SLAs and has sophisticated performance measurement tools that accurately reflect the customer’s or service user’s actual experience. Unfortunately, we are now seeing the legal profession moving into the field of drafting SLAs, changing the concept from a crystal-clear definition of the service and of service levels, back into a muddy, legalistic puddle. Back full circle? It’s time to start over. That is why this book is particularly important today. We must keep the service vision, definition and requirements clear – even more important today in a time of loose partnerships, complex – often virtual – supply chains and instant success or failure. In the e-world, particularly, customers are just one click from desertion. Where are SLAs going? Increasingly business-focused. Increasingly measured in real-time. Simple documents that cover complex service infrastructures. Providing competitive edge. Embracing penalties. The brave, who commit to tight SLAs and perform against them will win the commercial spoils. are end-users (customers) aware of them? Do Service Level Agreements exist for all applications? Do they cover all services? customer workload in business units (e.g., number of invoices produced)? forecast changes over the duration of the agreement? customer workload in terms of performance and capacity management? peak workload constraints to limit peak capacity? key records needed for recovery? arrangements for monitoring customer satisfaction? Are service level targets included in Project Specification? Are they included in application and hardware contracts? Are they included as part of system acceptance testing? Is there a formal sign-off stage at which the end-user (customer) accepts that new applications are meeting service level requirements? Is service performance checked against the service requirement specification at Post Implementation Reviews? for each type of usage (e.g. real-time by transaction complexity, batch turnaround, output etc)? · for each regime (e.g. prime, non-prime, weekend)? If so, are they published to their customers? Are customers committed to forecast their utilization? And keep to their forecasts? Do Service Level Objectives form part of the Computer Service job descriptions and targets for Management by Objectives (MBO)? Is the computing service charged out? are rebates given to customers for failure to achieve Service Level Objectives? and are any penalties applied if customers exceed utilization forecasts? Has a Customer Satisfaction Survey been issued within the last 6 months? If so, does it give scope for customer response on adequacy of Service Levels? better than 12 months ago? Are Service Level Review Meetings regularly held with customers to review actual achievement against service level targets? Are utilization and performance statistics provided to assist this review? Is performance measured at the customer’s terminal? in terms of income to the computing service? in terms of value to and impact on the business in the event of downtime? Does each application have a designated and documented owner? Has one person been nominated as responsible for all day-to-day aspects of the running of that application? Do customers have a single point of contact within the computing service for any queries, complaints or problems about the service (e.g. a Help Desk)? Is this single point of contact documented and promulgated to customers? Is there a single point of contact in the customer area for the computing service regarding service queries? Is the single point of contact documented and promulgated within the computing service? Are all customer problems (even “trivial” problems) logged? Is a formal, documented escalation procedure in place for customer problems? And is it promulgated to all relevant computing service staff and to customers? Are computing service responsibilities unambiguously defined, documented and promulgated so that this single point of contact knows who, within the computing service, to approach to resolve any query, complaint or problem which arises? is there a configuration diagram showing inter-related hardware and software? Are customer problems interfaced to computing service problem management procedures for hardware problems, software problems, telecommunications problems etc? Are customer problems interfaced to computing service change management procedures? Is change management procedure extended to all changes – including documentation and personnel? Are there back-to-back Service Level Agreements with other internal and external suppliers on whom the computing service relies to provide the service? Are formal quality assurance and quality control in place? Are zero defect goals in-place?